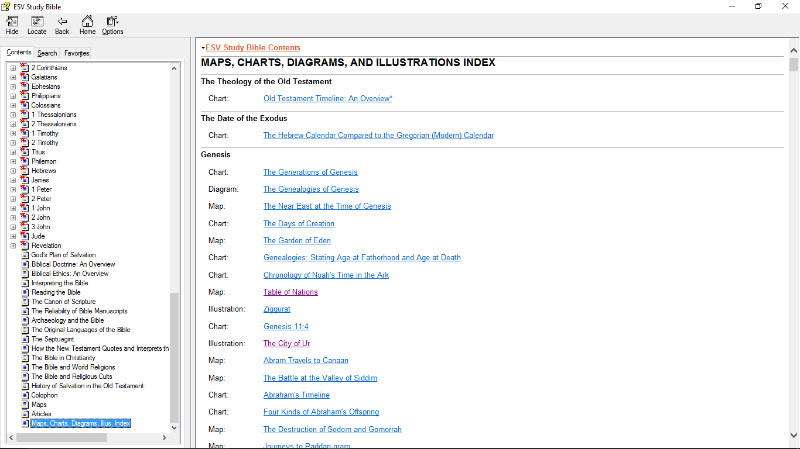 Can an index of the charts, graphics, illustrations, and such things be added to the ESV Study Bible to make it easier to use? I do not have a hard copy. I already have a hard copy NIV study bible. It has good deal of these things. What about soft copy for ESV study bible in Accordance? Actually, one is already there! Try opening the ESV Study Bible directly from your Library, not as a parallel pane to your Bible text. Click on the browser icon at the top left to open the browser. It will open and give you a really nice index to all the ESV Study Bible Resources. I thought about that this morning, but I was not sure if that shows only the maps at the end of the ESV Study Bible. I had a look in an analogue copy in a bookshop and there is a list of illustrations listed before the list of contributors which appears to be missing in the accordance version. you are right about the list of maps just covering the ones at the end of the bible, a quick look in genesis reveals a colour map which is not listed in the maps in addition to a chart of genealogies. I agree a list would be useful, but its serendipity when you come across one! Would it be possible to make the charts in the ESV Study Bible (or any other resource with charts) display as a picture rather than like a spreadsheet? The ESV Study Bible pics are all so great & the charts just don't seem to be as clear in the spreadsheet format. 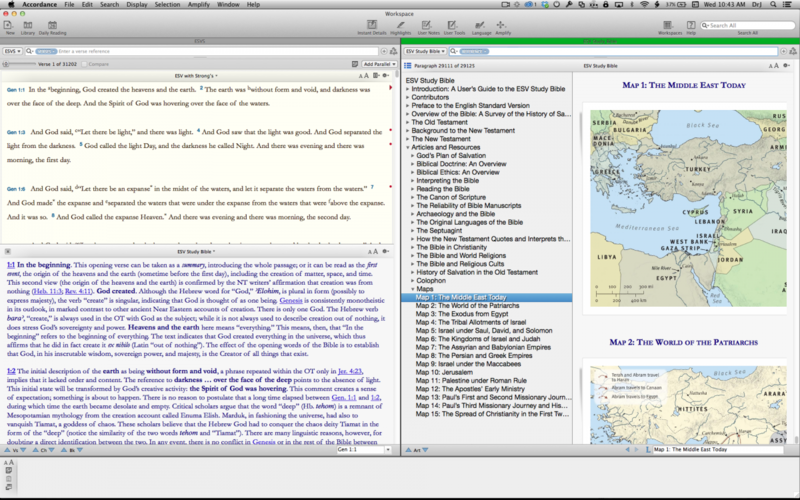 Notice the "Evaluating Kings of Israel and Judah in 1-2 Kings" chart in the ESV Study Bible for an example. Thanks for the consideration. If you make them pictures (which is much easier for us that making charts) the text inside cannot be searched. Is that really preferable? Helen, can i go back to the original theme of this thread. In the print copy, there is a separate index of all the images that appear in the text (in addition to the second index of the maps at the back of the volume). In my niv study bible in accordance you have included a similar index so that the accordance volume is the same as the hard copy niv study bible. Are there any plans to include the missing index in the esv study bible so that it also is a direct copy of its hard copy equivalent? (I have a photo on my phone if an image is required and in other instances you have updated your ecopies with missing material from printed copies). I am wondering if this missing index has been fixed for the ESV Study BIble? I was interested in adding this resource (mainly to take with me on my IOS device) but this issue has caused me to wait. I already have the ESV Study Bible in Bibleworks and the index of all maps, charts, diagrams, illustrations is included after the articles index, as Fraser has pointed out from the printed copy. It seems that the Logos version is also missing this index, I wonder why Accordance and Logos have missed this and yet Bibleworks include it? It's a most useful index. Thanks, but I am not sure this is the same index we are referring to. The one we are referring to lists all maps, charts, diagrams and illustrations included throughout the study Bible, not just illustrations. There is also a complete list of articles given immediately before this index that I don't see listed in the above screen shots. 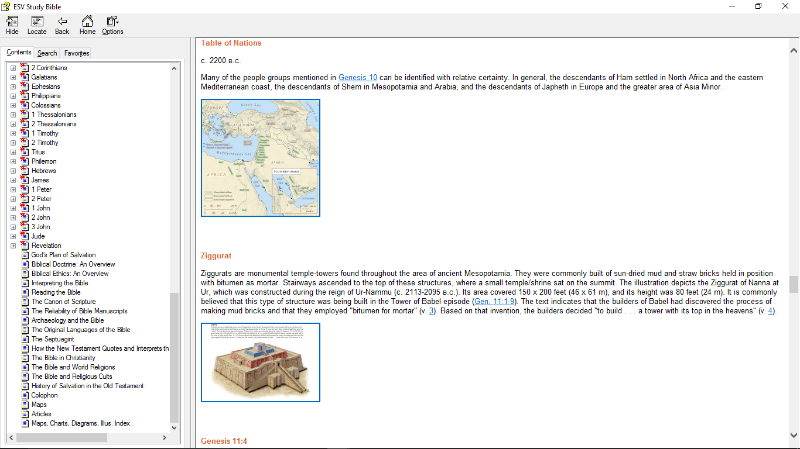 In the Bibleworks version a description and thumbnail preview is given for each entry and I can jump straight to any article, map, chart, diagram or illustration from this index. Here are a couple of screen shots, is this now provided in the Accordance version? Hmm, it doesn't look like the Accordance index is as complete as your screenshots. We got a hard copy for my son recently and I'll have to compare. I agree that the illustrations etc in the ESB are really good and it would be very helpful to have a complete list somewhere. Fraser mentioned above that his print version has the complete listing in the back so hopefully your copy has the same. We will add these listings into our version. It's not that we omitted them, but that they were not in the electronic text we originally received from the publisher, and at that time we did not make it a habit to add manually (via OCR, etc) this type of content. Thank-you Accordance for adding this index so quickly, this is Customer care! BTW, we've also turned the Daily Bible Reading Plan in the ESV Study Bible into a separate Devotional module. It can be accessed from your library and can also be set as your default devotional in your Reading/Research preferences. 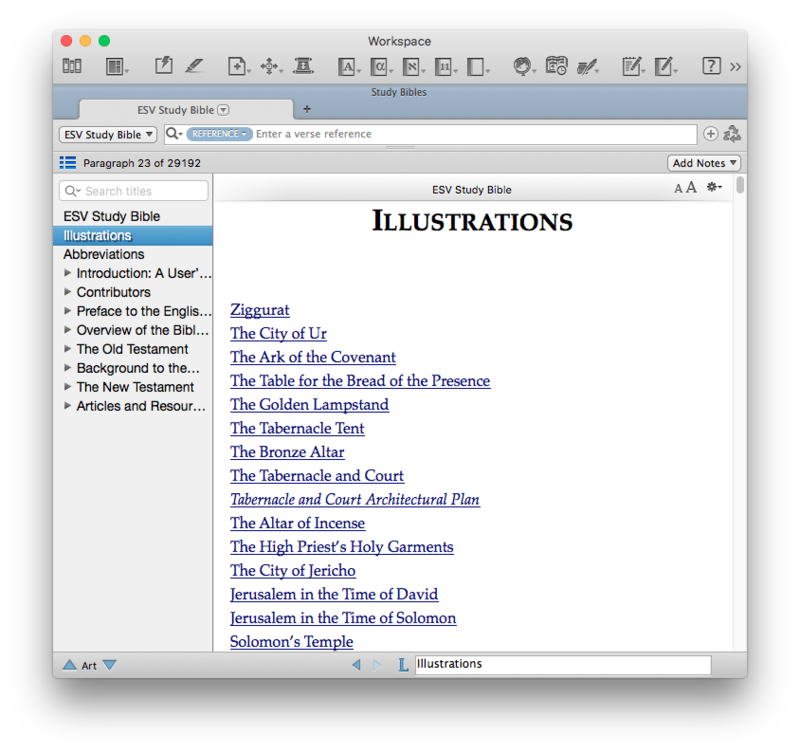 The module will appear in Easy Install for everyone who has purchased the ESV Study Bible.